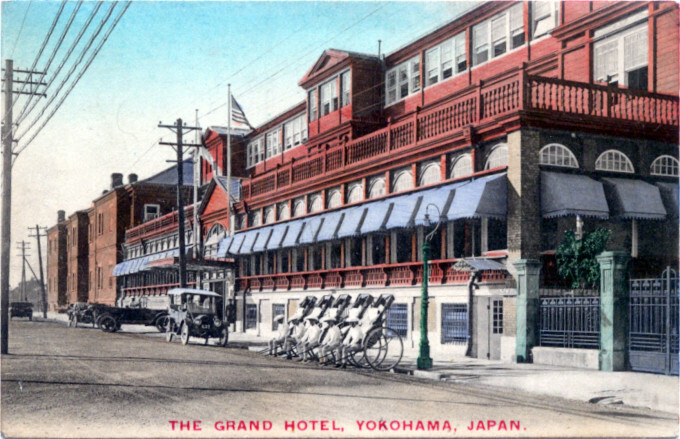 Grand Hotel, Yokohama, c. 1910. “Mr. H. E. Manwaring, the very capable boniface, who presides over the destinies of the Grand Hotel at Yokohama, is one of the men whose name is known to travelers all over the world. ‘Manwaring? Oh, yes! 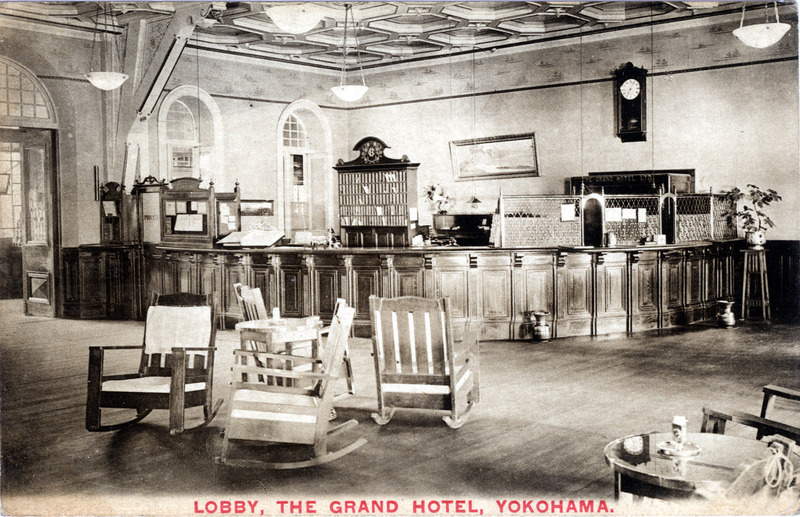 You mean Manwaring of the Grand, Yokohama, of course!’ And it is ‘of course,’ of course. 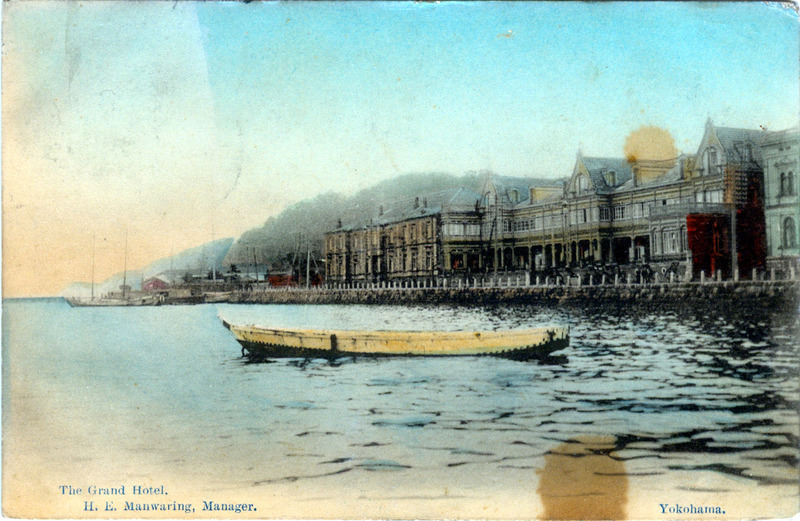 I have no idea of the birthplace of Manwaring, but I can tell you that if there are any more at home like him, it must be the home of hospitality and good cheer. “Whole view of Grand Hotel”, Yokohama, c. 1910. 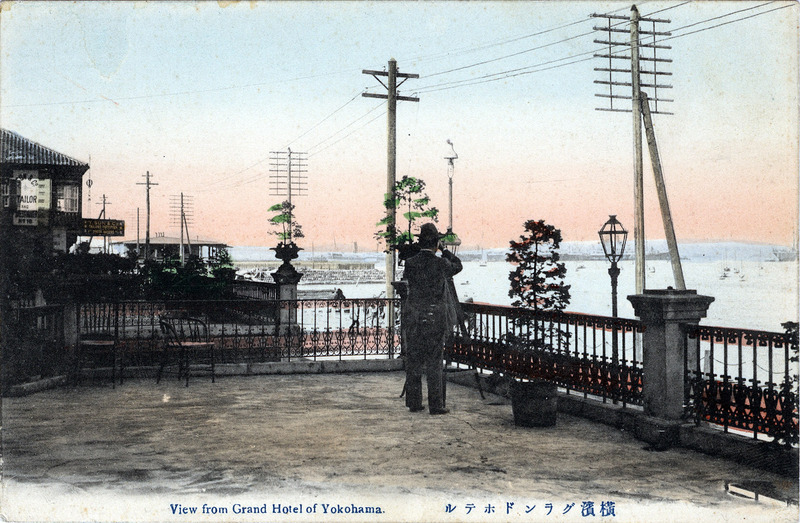 The hotel from the rear (center), looking out upon Yokohama harbor. 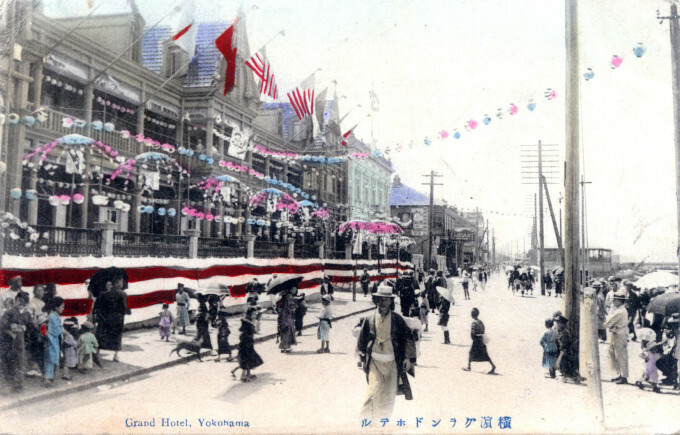 The Grand Hotel opened on August 16, 1873, on the Yokohama Bund, overlooking the harbor, and was soon considered the height of Western culture and elegance in Japan; “the place to stay” for well-monied travelers. It can no longer be determined with certainty who designed the Grand Hotel but the architecture has occasionally been attributed to R. P. Bridgens, the American architect who designed both of Japan’s first railway stations at Yokohama (Sakuragicho) and Shimbashi. 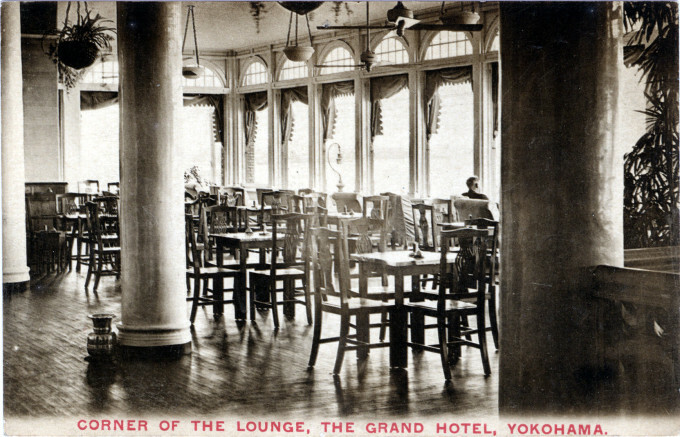 Among the Grand Hotel’s illustrious guests, English author Rudyard Kipling was a visitor and was amazed by the printed menus (handwritten menus at the time were the norm), and by the customers ordering food by citing the number assigned to dishes listed on the menu. “Standing on the verandah of the Grand Hotel, which is the largest and most commodious establishment of the kind in the East, and looking north, the bay with its shipping is stretched expansively before us. 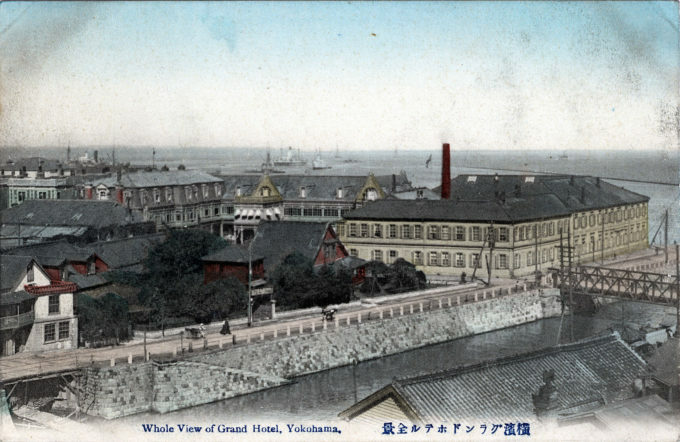 “View from Grand Hotel of Yokohama”, c. 1910.
yet with moderate charges. 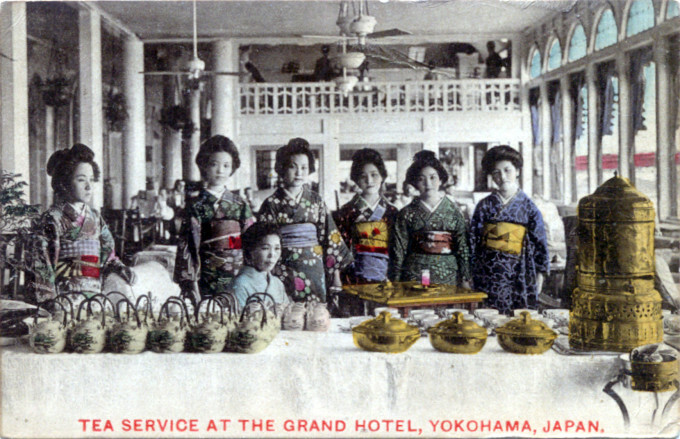 It is as famous for its hospitality as for its perfect service and unrivalled cuisine. It is one of the most inviting and homelike hotels of the world, and one of the best liked. To world-travelers the ‘Grand’ is as much a feature of Japan as Fuji-yama itself, and those who he would get the most enjoyment out of their trip to Japan make it their headquarters while there. 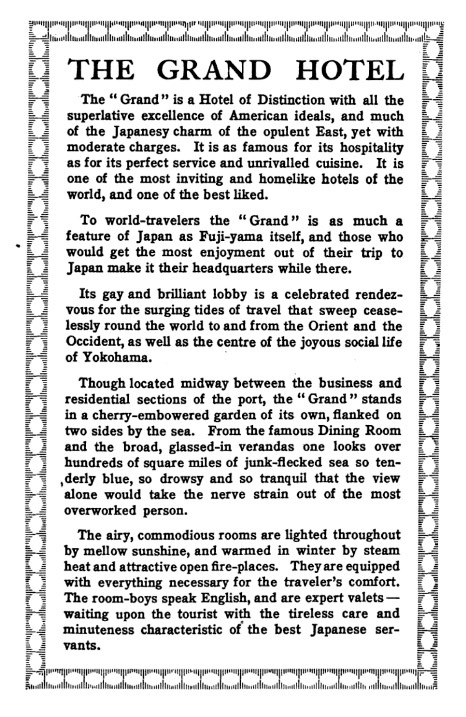 “Its gay and brilliant lobby is a celebrated rendezvous for the surging tides of travel that sweep ceaselessly round the world to and from the Orient and the Occident, as well as the centre of the joyous social life of Yokohama. 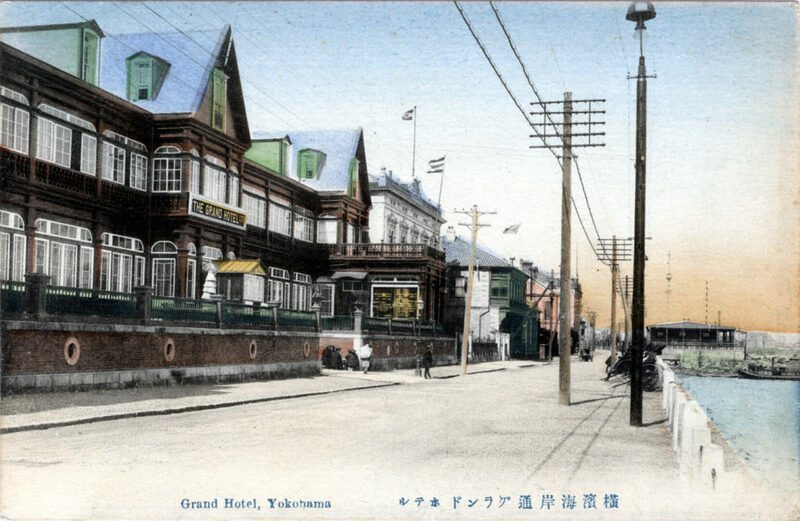 The Grand Hotel, Yokohama, c. 1910. Flag-bedecked Grand Hotel, Yokohama, in anticipation of the Great White Fleet arrival (1908). 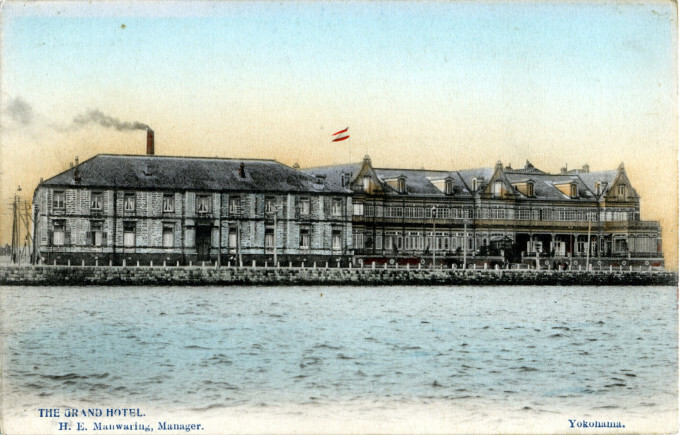 Harbor-facing exterior of the Grand Hotel, Yokohama, c. 1910. 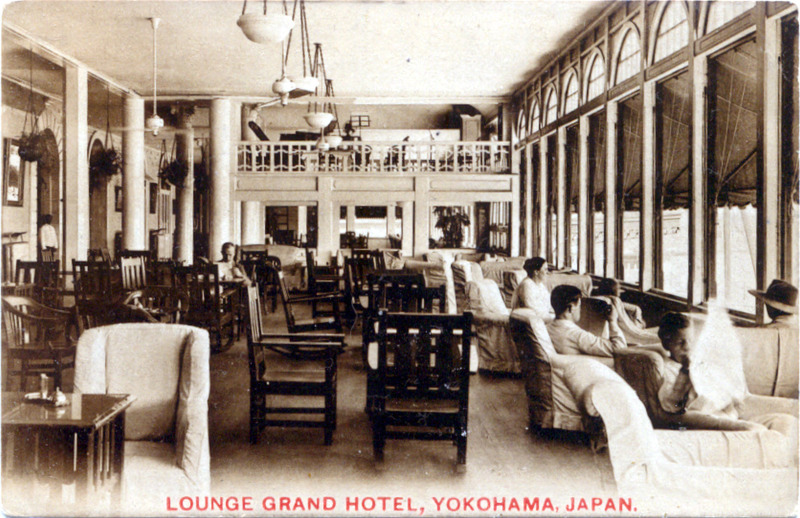 Grand Hotel, lobby, Yokohama, c. 1910. Tea service at the Grand Hotel, Yokohama, c. 1910. Corner of the Lounge, Grand Hotel, c. 1910. 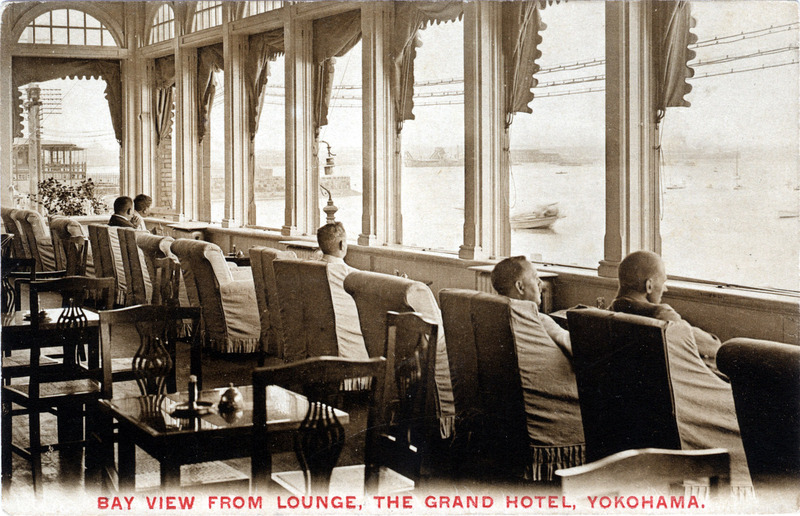 Harbor-facing lounge at the Grand Hotel, Yokohama, c. 1910. View from Lounge, Grand Hotel, c. 1910. 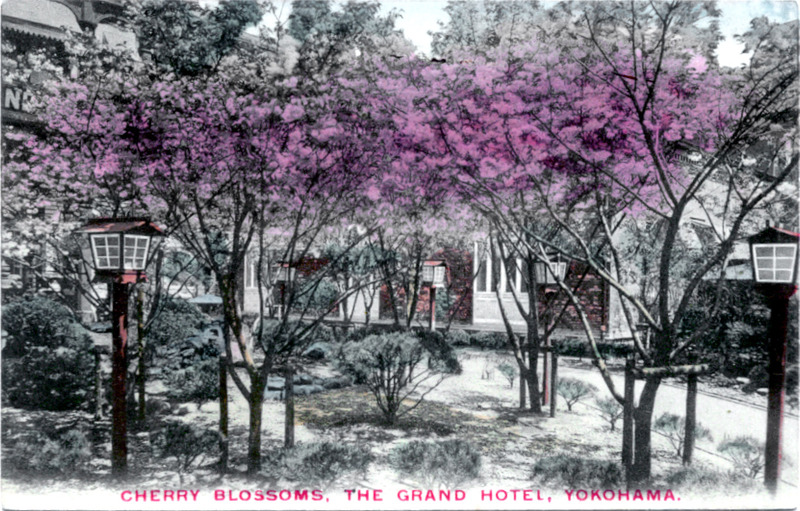 Cherry blossoms in the courtyard at the Grand Hotel, Yokohama, c. 1910.